Let’s get started with helpful information for your visit. You can also print out forms in the comfort of your own surroundings and complete them. Any questions? We’re here to assist. Please call us at (949) 274-8399 to schedule an appointment. Or send a request via email. Running Late? Need to reschedule or cancel? Please call our office as soon as possible (949) 274-8399. This courtesy allows us to serve other patients and adjust accordingly. If you would like to schedule an appointment with us and live outside the Orange County area, we have compiled a small list of hotel options that are within a few miles of our Institute. Learn more. Navigating insurance coverage and benefits can be time-consuming. We can assist. Our Institute and doctors have network (PPO) privileges with many private health insurance plans and providers. Additionally, we contract with a variety of (HMO) insurance providers. We also accept Medicare plans. Please be ready to provide any insurance information available during initial scheduling. Our insurance specialists can then review your specific benefits in advance of your visit, and help you with planning. For your convenience, we accept cash, checks, VISA/MASTERCARD, and AMEX. For your convenience, this section has the patient forms that should be brought to your first visit. We encourage you to print these forms directly from this site. All patients must complete our patient forms before seeing your doctor. If the child does not currently wear a hearing device, , please write ‘N/A ‘across the top of the Hearing Aid Benefit profile pages and return with the patient packet. If not wearing a hearing device for Tinnitus treatment, please write ‘N/A ‘across the top of the Hearing Aid Benefit profile pages and return with your patient packet. Visit us at either of our two convenient Orange County locations. You’ll also find a handy appointment reminder. 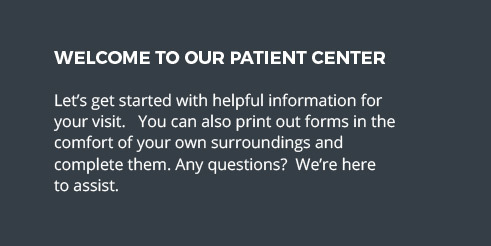 We welcome questions at any stage of your treatment—or even before it starts. We’ve captured 25+ of our most frequently asked questions right here. To learn more about our Institute, our services, or what to expect as our patient, please don’t hesitate to call us at (949) 274-8399. 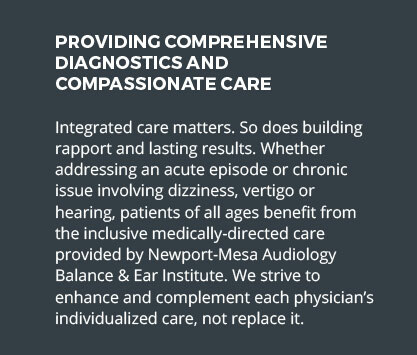 What sets Newport-Mesa Audiology Balance & Ear Institute apart from other providers? Everything within an easy-to-access setting – no traveling around. Approach. We are proud to be recognized as one of the country’s leading practices for the research, diagnosis, treatment and rehabilitation of patients with dizziness, vertigo and balance disorders. 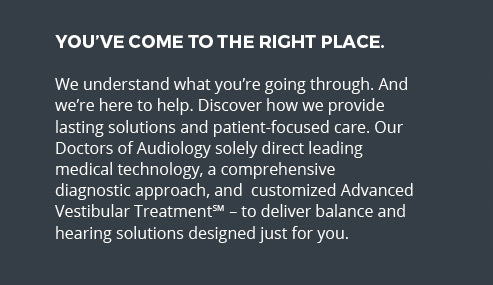 All patient care and treatment, including Advanced Vestibular Treatment™ (AVT), is solely directed by our doctors of audiology. We combine highly advanced medical technology and our expertise with the vestibular system of the inner ear. Our Institute is one of the most comprehensive practices in the U.S. offering patient-friendly testing and treatment programs for dizziness, vertigo, unsteadiness, tinnitus, and hearing loss. Results. All clinical staff focuses their research and expertise on vestibular (inner ear) disorders. The Institute’s board-certified vestibular audiologists, led by Executive Director and Founder Dr. Howard T. Mango, offer innovative diagnosis and treatment of BPPV, labyrinthitis, vestibular neuritis, vestibular equivalent migraine and motion sensitivity. To date, more than 90% of all Institute patients have demonstrated measurable, clinical improvement following personalized dizziness treatment. Our doctors are skillfully trained to custom fit patients with innovative, state-of-the-art hearing devices such as the Bluetooth-enabled devices and the invisible, in-the-ear Lyric™. Inclusive, easy to access setting: Our two convenient Orange County, CA locations are designed with patient comfort in mind to eliminate the many frustrations and time-consuming factors that patients face. All testing and treatment is done in one place – say goodbye to traveling around to endless doctors and therapies. How many patients has the Institute treated? Dr. Howard T. Mango and his clinical team have treated more than 30,000 patients for chronic dizziness, vertigo, balance disorders, and hearing loss, including tinnitus. We have been successfully treating patients since 1977. Do you have some type of mission statement? 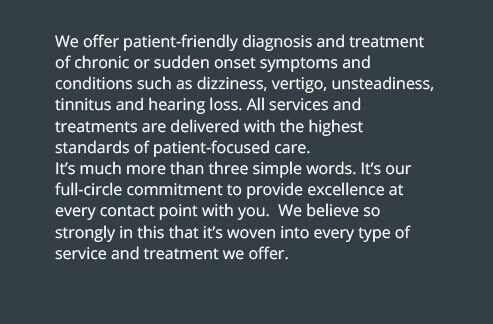 Our mission is simple, but it’s shared by all: to help permanently resolve each patient’s hearing, dizziness or balance disorder. We aim to restore our patients to the activity level they had prior to the onset of their illness/trouble/trauma. We want to help you hear and feel your best in every situation possible. Does a balance evaluation require a referral from my doctor? No, a referral is not required, though we receive many referrals from primary care physicians and physician specialists. Many insurance plans no longer require a physician referral. We recommend you check with your own insurance company, as coverage varies greatly plan to plan. As a service to our prospective patients, we are happy to work with you and your insurance company to check on any needed authorizations and coverage benefits. What is a balance evaluation? Our balance evaluation takes a comprehensive look at the vestibular system through interview, exam, diagnostic testing, analysis and depending on results, possibly a customized recommendation plan involving Advanced Vestibular Treatment™ (AVT). Because we want to identify and correct your condition as quickly as possible, our testing is thorough. We are the only Institute to assess all 10 end organs of the inner ear – the important pathway to the brain and your body’s sole balance center. What should I expect during a balance evaluation? Our clinical staff strives to ease any concerns you may have from the start. They understand that you really don’t feel at your best. Please allow five hours for this appointment, and feel free to bring along a friend or family member. We’ll make you both as comfortable as we can. Prior to exam and testing, your doctor of audiology reviews your medical history, reason for your visit and any symptoms you might be experiencing. Each testing procedure differs slightly. Before testing, we’ll discuss what we’re doing and why. Approximately 5-7 days after your balance evaluation, a detailed report containing evaluation results, conclusions and recommendations will be sent to your referring physician (if applicable). Remember that we are here to help support you through decisions to the best course of action. What exactly is Advanced Vestibular Treatment™ (AVT)? Advanced Vestibular Treatment (AVT) is a highly effective medically-based approach used by our Institute to diagnose and treat dizziness, vertigo, and balance disorders. Studies show that customized AVT is significantly more effective in resolving symptoms than traditional vestibular therapy, medication or general balance exercises alone. Is Advanced Vestibular Treatment™ (AVT) the same as vestibular rehabilitation therapy (VRT)? While both are forms of therapy, AVT is a highly effective and far superior form of vestibular rehabilitation. Dr. Mango has been leading research in this area for years. AVT is solely directed by our doctors of audiology and individualized specifically to each patient’s needs and treatment plan. The result is that 93% of patients completing AVT have success, and don’t live with dizziness, vertigo, or imbalance anymore. All of our doctors of audiology are specialists who focus their work and research on the vestibular system of the inner ear, where the majority of balance disorders begin. VRT conducted through physical or occupational therapy does not focus on the vestibular system. Why does Advanced Vestibular Treatment™ (AVT) work? AVT stems from years of evidence-based research and has shown to outperform traditional vestibular rehabilitation with its lasting results. We have documented years of successful results using our AVT approach. In essence, we’re teaching the brain to fix itself by taking advantage of the brain’s natural plasticity and ability to restore symmetry and sensitivity. Successful AVT improves each patient’s overall stability and motor control. The eyes play an important role, as each patient’s vestibuloocular reflex (VOR) is studied, strengthened and ultimately, enhanced. Our treatment combines physical and ocular exercise movements that target and develop those weakened response areas. How long does Advanced Vestibular Treatment™ (AVT) take? Sessions are generally 45 minutes and are offered at both of our Orange County locations. Patients typically visit our Institute 1-2 times weekly for up to 6 weeks or until their dysfunction is resolved. Additionally, select patients may be provided a personalized, home-based exercise and video therapy program that they can perform independently. Will testing make me sick? Testing has a purpose. It determines the cause of your symptoms and helps our doctors of audiology pinpoint an accurate diagnosis so treatment and relief can begin. Each patient reacts differently during testing. We will do everything possible to keep you comfortable. It is never our intention for patients to participate in anything that may bring about discomfort. The clinical chairs look like they make movements in different directions, and may move fast. Will it make me sick? Our chairs use slow and calculated movements to effectively diagnose and treat balance disorders. The positional chairs allow us to place patients at deeper angles that cannot be achieved with more traditional table maneuvers. There’s also less likelihood of injury by avoiding any manipulation of the head or neck. The rotational chairs allow us to isolate specific portions of the vestibular system while limiting the sensation of movement. And while each patient reacts differently, we try to minimize any discomfort patients may experience while in our clinical chairs. Does the Institute have the Epley Omniax® chair? Yes, we do. In fact, we are the only private practice in the U.S. with 3 chairs at our Orange County locations. Our Epley Omniax chairs are among only 20 practices worldwide that features this proven technology. Additionally we feature Neuro Kinetics rotary chairs like those used by the U.S. Military, as part of our testing and treatment. What if I don’t think I could possibly do all this testing during 1 session? What do you recommend? We’re confident you will do just fine with our approach and attention to your comfort. We prefer to complete testing during one session, unless it becomes absolutely necessary to split the evaluation due to unforeseen circumstances. We’ll take good care of you. Appropriate rest time is included and you’ll even have time to attend to those things of importance. Please don’t hesitate to ask us how we can make your experience more pleasant. Why should I consider a hearing device now? There has never been a more exciting time to experience firsthand the vast improvements in hearing devices. These are not your father’s hearing aids! The innovative solutions offered –from pinpoint clarity, to custom solutions and comfort – are almost endless. If you’ve come to us, or are thinking of coming to us, you suspect something may be amiss. Hearing loss occurs gradually over time, and you may not be aware of how significant your loss may be. 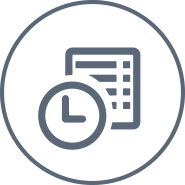 We’re ready to help you address concerns, forge a solution and get you there. Don’t miss out on the sounds that matter the most, like an impromptu chat in a busy setting …because today there are devices that will separate out sounds even in noisy environments. Or the quieter moments in life, like an intimate conversation, a child’s whisper… even the gentle patter of raindrops on a windowsill. Are new hearing aids that much improved in the past few years? Think about the technological advances made over the past 2 years on devices such as cell phones, mobile tablets and even TVs. Their capabilities are greatly improved. So yes, hearing aid technology has stepped up dramatically in the past few years. There’s improved aesthetic appeal and comfort, plus more refined sound quality and durability than ever before. Solutions like the Lyric™ extended wear device are completely invisible with no batteries to change. Most recently, the Opn™ hearing device is the first device that is Internet-ready, designed to connect directly to your smart-enabled devices. Do I really need two hearing devices? Often patients do need two devices because both ears can be simultaneously affected. Ears work in tandem, like the eyes. If vision on both sides needs correcting, you wouldn’t fix just one. Similarly, if both ears show a hearing loss, two devices are better in helping you understand and discriminate speech, especially in noisy settings. I’m concerned that a hearing device won’t provide any real hearing improvement in a busy or crowded place with lots of noise. How can you fix this? Newer devices showcase the most recent advances in hearing device technology with features that make sounds more accessible. That allows users to hear, discern and actually separate sounds from different direction. We’ve evolved beyond the days when devices pushed the main sound to the front and background sounds were suppressed. So this new generation of ‘effortless hearing’ makes it easier for people with hearing loss to communicate and stay socially active, with less listening effort and greater ability to remember what’s being said. We are committed to offer several treatment options to meet a variety of patient needs. How long does it take to adjust to a new hearing device? The adjustment time can vary; some people adjust quickly, while others take a bit longer. Most however, do get used to it, and universally, everyone loves hearing naturally again. Your doctor of audiology is sensitive to your needs and desires, and will work closely with you throughout to ensure a comfortable, satisfactory and successful transition. How do I maintain my hearing devices? Like anything, proper maintenance and care can extend the life of your device. A valuable tip is taking the time to keep the ear canal and the hearing device itself free of debris, wax and moisture. We can show you easy and manageable ways to do this. How does hearing loss affect my brain? Each individual is different, however studies continue to demonstrate that cognitive abilities remain stronger for a longer period of time when the brain can process sounds through greater amplification and clarity of sound. And the ability to hear clearly and understand speech patterns improves connectivity and participation with those around us. I think I’ve got a little hearing loss. But do I really need an ear exam? What’s the risk of putting it off? Rarely do primary care physicians conduct hearing tests as part of a physical. So chances are you haven’t had your hearing tested in quite some time. Let’s consider this: your ability to make sense of what you hear, participate fully in conversations, even your safety when in a moving vehicle – depends upon the ability to differentiate, locate and process sounds. So making sense of what you hear and using it to your best advantage depends on how healthy your hearing pathways are. Any amount of hearing loss decreases these abilities, and certain lifestyle factors and habits may, too. So, while it’s true that postponing an exam won’t accelerate hearing loss, it will keep you from knowing the severity of your loss and prognosis for the future. Avoidance may also affect your ability to adapt to a hearing device once your time comes. There are some interesting hearing devices. What are extended wear hearing aids?And what are hearing devices that connect to ‘the Internet of things’? Let’s start with extended wear hearing aids. The Lyric™ device by Phonak is the only extended wear hearing device that is 100% invisible. Lyric has been available for a few years now and we have had excellent results and patient satisfaction. They are comfortably placed in the ear canal by our skilled audiologists during an office visit. Lyric can be worn 24 hours a day, seven days a week, for months at a time. There’s little worry, no fussing, and all without surgery or anesthesia. The Oticon Opn™ is an example of the latest in communication technology embedded into one powerful, yet feather-light device. The device can connect to the “Internet of things”, which means Opn can seamlessly connect with other appliances and devices that rely on the web. The Opn device features a tiny chip that has the capability and speed needed to manage multiple sound sources, analyzing and processing sound data 50 times faster than other devices. How noticeable may a hearing device be? We understand your concern. But the reality is that it’s harder to hide a hearing problem than a hearing device. Thanks to advances in technology, today’s new devices are smaller and more discreet than ever. People may not notice or see it. One type offered by our Institute is the Lyric™ extended wear device. Lyric is professionally placed deep inside the ear canal by your doctor of audiology, and is 100% invisible from the outside. And there’s no fuss and no continual adjustment. Only you know you’re wearing it. How much do hearing devices cost? You and your doctor of audiology will select the model that best fits your needs and budget. Pricing can span a broad range based on features, design and potential personal health insurance reimbursement or subsidy. Usually our prices are much lower than what manufacturers suggest. As a service, we provide our patients a no-risk, 30-day trial. Please keep in mind that your purchase includes much more than the device itself – you also will receive related testing, fitting and follow-up care with your doctor of audiology to ensure your investment is right for you. As an additional feature, a warranty covering loss, damage and repair is included. How do I know which hearing device brand or maker is right for me? And what about technology – how do I narrow it down? but also our exacting standards for quality, value and warranty support. We are located in two easy-to-access locations in Orange County, California.